Maximum Security, whose three previous starts were dominating wins in a $16,000 maiden claimer and two starter allowances, lulled the perceived best three-year-olds in South Florida to sleep Saturday when taking the $1 million Florida Derby (G1) at Gulfstream Park in wire-to-wire fashion. When Hidden Scroll, the 9-5 favorite and pacesetter in last month's Fountain of Youth (G2), was taken back to third early as part of a learning-to-rate exercise, Maximum Security took a lonely lead under Luis Saez. He was chased by 71-1 maiden Bodexpress, and the pair ran one-two around the track with Maximum Security setting fractions of :24.42, :48:98, and 1:12.90. Maximum Security had plenty left in the tank for the stretch run, and the son of New Year's Day rolled home decisively in a time of 1:48.86 for 1 1/8 miles over a fast track. He paid $11.60. 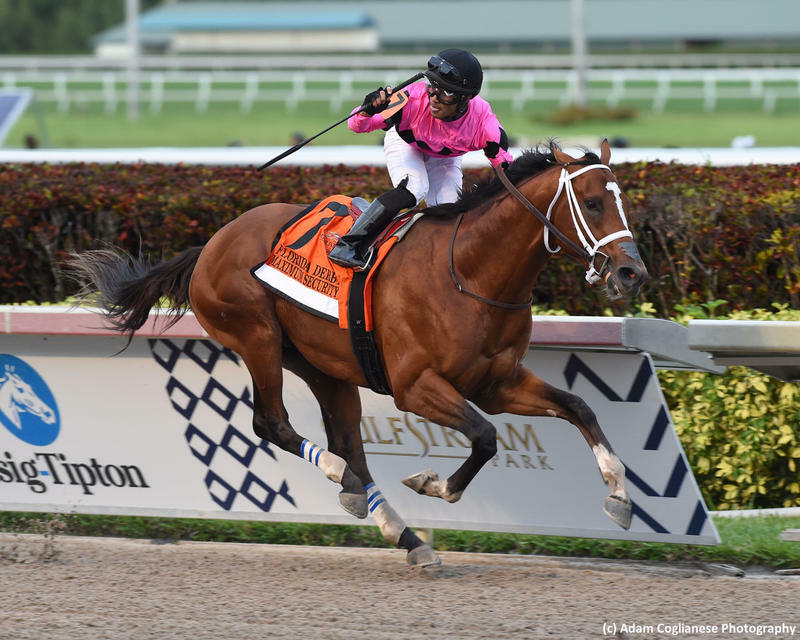 A homebred campaigned by Gary and Mary West, who also own juvenile champion and fellow Kentucky Derby (G1) contender Game Winner, Maximum Security clinched a spot in the Run for the Roses earning 100 qualifying points. Bodexpress, who has run second in three of five starts, likely did as well earning 40 qualifying points. Code of Honor and Bourbon War, first and second in the Fountain of Youth, rallied for third and fourth, respectively, in the Florida Derby. Code of Honor earned 20 points to boost his total to 74. Bourbon War's 10 points increased his total to 31. This was the first start beyond seven furlongs for Maximum Security, who trainer Jason Servis felt could get the extra quarter-mile given his pedigree. "His father won a Breeders' Cup (Juvenile [G1]) at a mile and a sixteenth and I had a lot of confidence in Luis Saez," Servis said of the decision to test deeper waters. Maximum Security won his first three starts by a collective 34 1/2 lengths and, dependent on the outcome of preps over the next two weeks, may arrive at Churchill Downs as one of the betting favorites in the Kentucky Derby. Bred in Kentucky, Maximum Security is out of the Anasheed mare Lil Indy, a half-sister to multiple Grade 1 winner Flat Out.